Developments amongst the "Blazing Bows"
Over time, the Bows and the other students in the related schools grow up and sometimes form other bands. Here the Blazing Bows perform at the Old Settlers Music Festival. Notice the unique mandolin-bass in the left background. Beth White, playing the bass, is one of Bill Branch's guitar students who decided to learn upright bass. Her mother, Rose, built the mandolin-bass (renaissance-style) from plans she found on the internet. 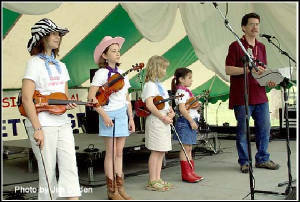 Some of Mary's kids participate in the youth talent contest at the Old Settler's Music Festival in April 2003. They did not win, but they did place, and they learned a lot to prepare them for next year's contest. "Off Center" is an outgrowth of older students from Mary Hattersley's violin fiddle program and Bill Branch's guitar program. Here they play on a stage nearly suspended over a cliff over Lake Travis at a restaurant (with a wonderful view) called the Iguana Grill. Watch out for them in the future. They have already recorded their first CD of original material, and it is pretty darned good -- especially for a first attempt. "Off Center" -- students from both Mary and Bill Branch's music programs (2006).